Avery’s popular pizza place is right across the street from the inn, giving her a firsthand look at its amazing renovation—and a newfound appreciation for Owen. Since he was her first boyfriend when they were kids, Owen has never been far from Avery’s thoughts. But the attraction she’s feeling for him now is far from innocent. I enjoyed the male narrator since the book is from a man's perspective. 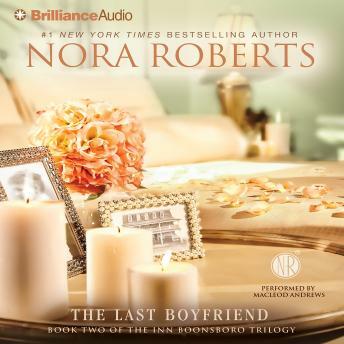 As always, another great Nora Roberts' book. Swoon....just loved it. Even better than the first novel. Enjoyed listening to The Last. Boyfriend. Cute book. I really got into the story. it is just kind of hard to get into a romance book when a male narrator, otherwise pretty good book.